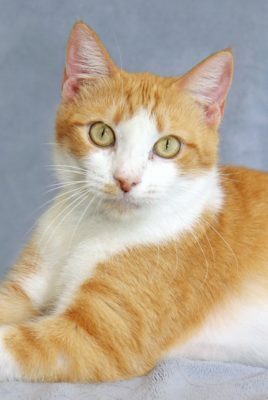 ENCINITAS–Tauri is pet of the week at Rancho Coastal Humane Society. She’s a 5-year-old, 10 pound, female, Domestic Short Hair cat with a Red and White Tabby coat. She loves other cats and older kids. Tauri was transferred from another shelter through the FOCAS (Friends of County Animal Shelters) program. The $100 adoption fee for Tauri includes medical exams, vaccinations, spay, and registered microchip. For more information call (760) 753-6413, visit Rancho Coastal Humane Society at 389 Requeza Street in Encinitas, or visit www.SDpets.org. Kennels and Cattery open 11 a.m. to 5 p.m. every day but Tuesday.